Medusa is a powerful creature, whether in myth or historical conjurings. She is generally portrayed as the embodiment of all things feminine, something which must be mastered by Greek civilization. The name Medusa is credited to mean many things. It could be a form of the Greek word metis, meaning feminine wile, an aspect which the male gods themselves strive to obtain and which was ingrained into human women during their creation (7). Medusa also means ruler or queen, and possibly guardian, terms which suggest powerful positions not commonly associated with proper Greek women. Apollodorus writes of possible historical events which could have led to the myth of Medusa. Even these vague historical events speak to some degree of the power of the Greek male civilization over the female power. In the first event described, Medusa is portrayed as a beautiful woman in a male role leading an army against Perseus (1). She is murdered during the night by Perseus, a subtle act of the male control over metis. In the second event described by Apollodorus (1), Medusa is merely a wild woman from the Libyan desert. It was conjectured that this woman wandered to Lake Tritonis and pestered the locals, until Perseus killed her. Again, to some degree this shows the Greek belief in keeping women under tight rein. Such "wild women" are dangerous and must be dealt with quickly. This attitude probably stems from the Greek belief that women were created by the gods as a punishment on men (7). It is fitting that Athena is said to have wished this wild woman to be dealt with, as she is frequently the representative of Greek masculine justice (as seen in Aeschylus's Oresteia). Medusa could have been a very prototypical goddess of a matriarchal society. Her hair of snakes and reptilian skin are symbolic of the natural cycle of birth, death and rebirth. Snakes are used due to their shedding of skin, their rebirth to a new skin. This cycle is paralleled with women's natural cycle of menstruation, which was believed to be synchronized with the cycles of the moon and tide. The snake also has an intimate connection with the earth, as it must slither across its belly, embracing the ground. In classical Greek culture, the snake is also a wily and deceptive creature, intelligent but to be distrusted in all things. This matches well with Greek views on women as a whole. Medusa's wings symbolize the sky, the freedom and mastery over worlds, the transition between the worlds of earth and sky. The boar tusks protruding from Medusa's mouth seem to present a mixed message. The tusks are meant to cause pain and fear, but the pig was also used in Greek religious practices as a symbol of birth and fertility, probably due to its multiple breasts and large litters. Medusa's ability to turn men into stone is an important facet of her feminine power. This is the power over all life, the ability to return life back to the earth from which it came. This is the power which must be reigned in by the patriarchal Greek gods, for it represents a total control over the natural cycle. 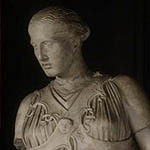 Ovid suggests that Medusa was once a beautiful woman, whose charms could rival those of Athena (9, also intimated in 4). When Poseidon sees Medusa praying in Athena's temple, he is smitten and he ravishes her there. For this atrocity to her temple, Athena punishes Medusa, a testament to her continuing support of the male hierarchy. It is Medusa's fault for attracting the lusty god of the sea, for as a female that is inherent in her nature (7). This would almost seem to trivialize the power of Medusa, suggesting that it was Athena and Poseidon who inadvertently created the power, rather than Medusa being born into the power of her own right. 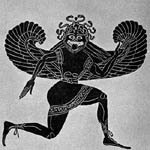 This story was probably originated after the story of Perseus, in order to further legitimate the control of the male-order gods. Perseus and Medusa have a complex relationship in Apollodorus's myth. 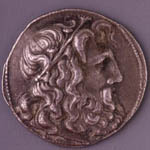 Athena constantly provides aid to Perseus in his quest to conquer Medusa. Thus, Perseus represents the Greek order and its backing of the gods. Medusa is one of the last residuals of the earth goddesses, and as such she represents the earth mother who has, during Greek power, become evil and twisted. In this more personal meeting between Medusa and Perseus, Medusa's power over men is not just power over life and death, but the power of female to cause impotence or castration of the male, symbolized by turning the male to stone with just a glimpse. By beheading Medusa, Perseus regains control of his manhood and ensures the silence of feminine wile. With the removal of Medusa's head, all threats to the Greek male order are diminished and she is able to give birth to Pegasus and Chrysaor, Poseidon's children. These children burst from her neck in a gout of blood, symbolic of menstruation and Medusa's power over the cycles. The decapitated head of Medusa continues to retain its power, manifesting control of both life and death. In the Metamorphoses, Medusa's undead sight causes sea plants to harden above the water, retaining life beneath, an unceasing natural cycle. Also, from the command of Perseus, the great Atlas is turned into a mountain teaming with plant life, continuing the duality of death and rebirth. With the mounting of Medusa's head upon Athena's aegis, Medusa's power has been completely insinuated into Zeus's pantheon. No longer is she a symbol of the earth mother. She is instead a symbol of Athena's fierce military strength and strikes fear in any opponents to Athena's will. Medusa was once a powerful feminine symbol, with control over the natural cycle and in harmony with the worlds of earth and sky. As such she posed a great threat to the power of the Greek male-dominated sky gods. In order to subjugate Medusa's power to the male order, she is decapitated, and her head is used to further buttress the dominion of the male over the destructive and wily female.